I found out in July 2017 that I’d been accepted into Peace Corps | Madagascar. That left me with 7 months to pack and clean out my apartment, and seven months to obsess about what to pack. And this from someone who hates to pack. And someone who hates to shop. And then I went and bought a house in October 2017. And I had already planned vacation for December 2018. So I packed for Madagascar as well as my vacation to Germany/France in December while I was packing up the apartment for the impending move. I scoured other PC blogs’ packing lists–for Madagascar, other African countries, even cold weather Eastern Europe/Asian countries… just to see what I was up against. I put effort into packing. I drudged through Amazon customer reviews. I wandered up and down REI’s aisles without buying a thing. I enjoyed crafting the spreadsheet more than the actual shopping. Not related at all, but a somewhat ironic tangent: I was once in charge of logistics for planning my college’s fencing team flight from Greenville to Philadelphia and securing lodging while in Philadelphia. 13 college students, flying with sabres, foils, and epees constantly reminding them not to say ‘weapons’ in an airport even though that is totally what they are called collectively. Reminding people to pack clothing separately from fencing gear in case bags were confiscated, and yet I forgot socks. Despite popular opinion, this is not a 2 year camping/backpacking trip. I will be living mostly in one place for 2 years. A place that most likely lacks indoor plumbing and electricity. Madagascar is a poor country. No need to have $200 hiking boots when most, if not all, of my neighbors will be barefoot. All the time. I’ll forget something. Hopefully, it won’t be my passport. Or underwear. A giant duffel bag–with wheels, a hiking backpack, a school backpack x2 and a messenger bag. Not all of these bags are going to Madagascar. At least not at first. One bag has the December vacation clothing in it. The first thing to keep in mind is that no amount of stuff will make it easy, and no one item will make the difference between having a great experience and a terrible one. The second thing is to keep in mind that even though 2 bags doesn’t sound like a lot, you will still have way more stuff than any of your neighbors have. Having 3 pairs of shoes to carry you for the next 2 years might not sound like a lot, but remember that most people you’ll be living near are lucky if they have one pair of shoes. It is very humbling. 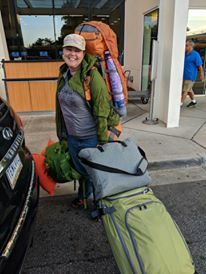 Hopefully my suggestions and advice below will help you avoid packing stress as much as possible but help you arrive to Madagascar well-equipped and excited to serve. A suitcase. A duffel bag. Something big. Something sturdy. It’s going to get abused. It may fall apart; it may surprise me and last my full service. I’ll probably use it as storage once I have a home. A school-type backpack. Can be stuffed to capacity and carry a weeks’ worth of clothing. A messenger bag. Good for books, notebooks, official documents, plane snacks, travel pillow, ect. 1 belt: a few years ago I bough a durable leather belt from the men’s section of REI. I’ve never gone back. Sleeping bag: It’s down, but lightweight REI brand. Sleeping pad: REI brand. On past travel, I opted not to use one, but this time around is different. Tent: REI-brand… two-person, simple setup, easy storage. Clothesline. Braided rubber from REI. Note: At training I’ll be provided with a Peace Corps’ first aid kit. Again, this is my pre-service packing list. Overall I feel pretty good about it, but that’ll change: Things will break; I’ll send things home, and hopefully I will have some awesome friends who will send me things while I’m here.